Had a wife and couldn’t keep her. And there he kept her, very well. One of America’s oldest native crops, pumpkins were an important staple to native Americans long before Europeans crossed the Atlantic Ocean and learned of them. Foods from the new world included; corn, potatoes, sweet potatoes, tomatoes, peppers, squash, pineapples, peanuts, cacao beans. The hard squash brought to Europe and a steadfast food of the colonists inspired many a poem and rhyme. 1. Put beans into a medium bowl; cover with cold water by 2 inches. Drain beans and transfer to a large stockpot. Make bouquet garni: Place bay leaves, thyme sprigs, and the peppercorns into a coffee filter or cheese clothe; tie into a bundle with string. Add stock, onion, and bouquet garni to pot with beans. Bring to a boil, turn to a simmer. Cover and cook until beans are tender. Add water if the pot runs dry. Drain beans, reserving cooking liquid. Discard bouquet garni. Saute the sausage, onions, leeks, carrots and celery and add the mushrooms last. Stir in flour, and cook 2 minutes to allow the flour and fat from the sausage to combine. This is the thickening agent. Reduce heat to medium. Add milk; simmer 5 minutes. Stir in beans, reserved cooking liquid, sage, thyme leaves, and 2 cups water. Bring to a simmer; cook until thick. 1. Cut out tops of pumpkins, and reserve. Remove seeds. Rub inside of each pumpkin with the oil, and season with salt and pepper. Place pumpkins and tops right side up on baking sheets. Bake 25 minutes. 2. 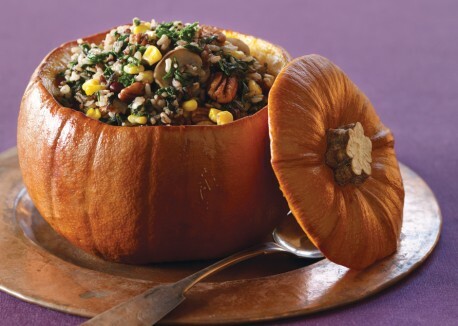 Divide the stew among pumpkin shells. Place on baking sheets, and bake until pumpkins are soft. I love it! It looks beautiful!